UFC 234 is right around the corner. The event takes place inside the Rod Laver Arena in Melbourne, Australia this Saturday night (Feb. 9). In the main event, Robert Whittaker will defend his UFC middleweight championship against Kelvin Gastelum. The co-main event will see future UFC Hall of Famer Anderson Silva do battle with Israel Adesanya. MMA News has kept you posted with updates leading up to fight night. That includes the UFC 234 weigh-ins. 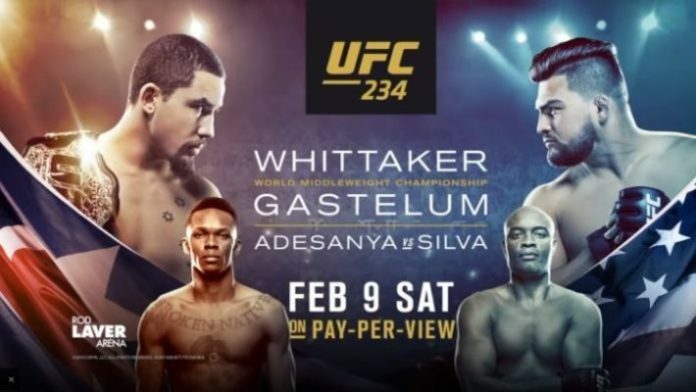 The time has arrived for our UFC 234 predictions courtesy of myself, Ed Carbajal, and Andrew Ravens. That’ll do it for the UFC 234 predictions. Do you agree with the MMA News staffers? Who do you think will emerge victorious on the main card? Give us your predictions in the comments below and be sure to stick with us for live coverage of UFC 234.